Taken from the closed gate. I was slightly disappointed when I visited this 5 storey tower house. I knew restoration had been carried out for a number of years, so when I read the scaffolding had been removed from the building I thought now would be a good time to visit. Alas there is still no public access to this historic site. 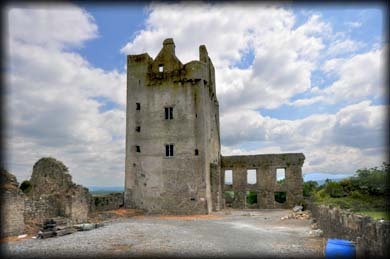 The Manor at Kilcash was in the hands of the Wall family before passing to the Earl of Ormond sometime in the 16th century. The Manor was mentioned in the will of James Butler, the 9th Earl, in 1545 and remained one of the chief Ormond Butlers strongholds for centuries. 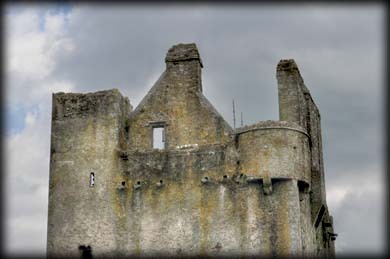 At the end of the 18th century John Butler, the 17th Earl of Ormonde moved the family into Kilkenny Castle and parts of Kilcash manor were sold off. 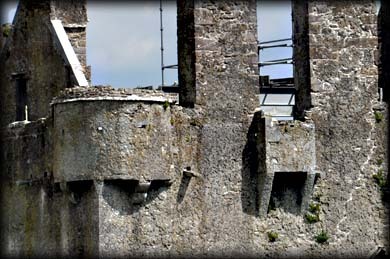 By the middle of the 19th century the castle had fallen into ruin. 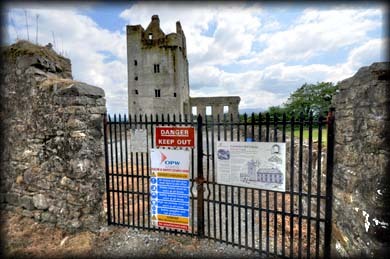 The castle is known for the poem A Lament for Kilcash - Caoine Cill Chais (Irish) which mourns the death of Margaret Burke. She held the title Lady Iveagh from her first marriage. Margaret later married Col Thomas Butler. The Colonel and his wife are buried in the Butler mausoleum at Kilcash Church 130 metres to the west. Remains of two storey house added to the west wall. 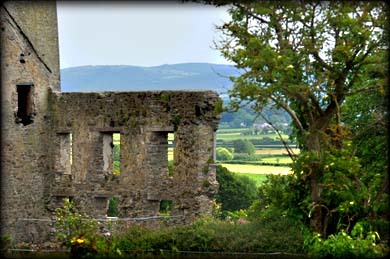 Situated: From Kilcash Church head north and turn right at the T-junction. You will see the castle on your right. Discovery Map 75: S 3258 2741. Last visit June 2015.